Alchemy Worx are about to release their new whitepaper on Subject Lines, in this week's Infobox, and it has some very interesting (and possibly quite controversial) findings. The study was conducted on 646 subject lines across 205 million messages earlier this year. By repeating the strategy behind MailerMailer's Email Marketing Metric Report (2008), they were able to achieve the same findings as MailerMailer, however, when analysing the subject lines in more detail, the results became very different. Longer subject lines tend to optimise click and click-to open rates. They also analysed not just the number of characters, but also the relationship between the number of words within a subject line and its open and click rates and found there to be similiar results. The report also then goes onto look at why this would be so and discusses what I think to be the most interesting finding in this study - that the longer the subject/the more words which are used, result in the 'right' type of people opening the email i.e the subscriber is given enough information to be able to determine whether the email is relevant to them and hence is more likely to take action and click through. OK...so you've heard it before, yeah yeah...serialize articles and it will draw people back again and again. But how many of us actually do it within our newsletters? This week at Inbox/Outbox London in his presentation, my good friend Dela Quist of Alchemy Worx brought this up as a great way to increase readership. Thinking about the popular soaps which are around, the phrase which people use when referring to them is 'hooked on it'. I have a friend (no, it's not me!) who is 'hooked' on the Australian soap, Neighbours. They insist on discussing it with me even though I don't watch it (their logic being because I am Australian I must watch it). She is 'hooked' and keeps coming back again and again - it's powerful stuff. Serialization is not only applicable to retention newsletters though. You can also use it with your promotional emails. One way of doing this is by offering tokens or vouchers in each email and the reader having to collect a number of them in order to redeem a special offer or prize. In the UK, Eurostar sometimes offers very cheap fares upon collection of a number of tokens which are published in one of the leading newspapers. This can be very easily applied to marketing emails. Another very easy drawcard to implement is to promote what the next issue is going to contain. This is what the soaps do. Have you ever noticed that immediately after the show has finished, they start promoting the next show? Again, a very easy, yet powerful marketing tactic. Anyhow, I'm convinced. I've decided I'm going to take action and start planning for serialized content in both the newsletters which I am Editor of. After all - if it's so easy, how hard can it be? Remember, when collecting opt-in information, ask your customers for personal information for marketing efforts such as birthday offers. The folks over at Blue Sky Factory developed a “How to Whitelist” page. In the blur of deciding on campaign themes, offer strategies, and creative approach, don't forget about the Shopper, who is at the center of this whirlwind. When Bath & Body Works launched their website, they didn't do ecommerce so their email needed to build their brand and send traffic into the brick-and-mortar stores. Their solution was to create print-and-go coupon emails. Over 100 screenshots of welcome messages selected by Patrick McNeil. Check them out! There are new regulations, but do you know how to ensure you're following them? Here's a guide. Yahoo has introduced the availability of two new e-mail domains that will give users the chance to register for the e-mail address or Yahoo ID of their choice at ymail.com or rocketmail.com. Silverpop uncovered some interesting results when it recently joined with Internet Retailer magazine to conduct research for the “Top 500 Guide” profiling the largest 500 U.S. retail Web sites ranked by annual sales. To evaluate the email programs of the top online retailers, their research team logged on to the Web sites of 820 top retailers identified by Internet Retailer and registered to receive emails from each that had an email marketing program (94 percent of Top 500 companies vs. 83 percent of other companies studied). Then they compared the practices of Top 500 retailers to the other 320 retailers. Not surprisingly, nearly six out of 10 retailers in the Top 500 offered a preference center at opt-in, while only one out of four other retailers studied did so. However, nearly three-quarters of the companies in the Top 500 with email programs didn’t offer customers any alternatives to unsubscribing, such as choosing different subscriptions or altering message frequency. And even more interesting, three out of four companies that had offered choices at opt-in didn’t offer to let recipients change those choices when they went to opt out. And the most surprising finding: one out of five companies that didn’t offer recipients any choices when they opted in to receive emails did give recipients choices when they tried to opt out. As a last ditch effort to keep subscribers on board, these companies offered to send less often or send different types of content. While this may be a successful strategy for some companies that want as much freedom as possible in their frequency and content up-front, the impact of this tactic should be closely measured, since recipients may choose to hit the spam button instead of going to the trouble of unsubscribing, jeopardizing your deliverability. While the study underscores that leading retail companies do optimize their programs for best results. It also reveals that even the best programs can improve and take results to new levels of success. See how a marketer increased conversions more than 50% by embedding video in emails. 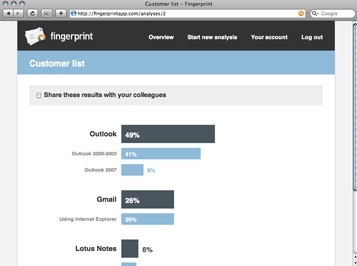 Includes deliverability and subject line test data. Plus, what’s the best video length to use. See how one retailer launched and grew a loyalty club into 2 million happy subscribers who keep coming back for more. Includes clickthrough and coupon download rates that are simply delicious. The Retail Email Blog: Stat Source: Sign-up forms, channel preferences, etc. After blowing past 1100 work emails last week, I decided it was time to move some newsletters off my work address, and over to a personal address. I imagine a lot of people have this need as well everyday. there is a significant segment of users who maintain "mobile only" email addresses. It's amazing how many people do not know how open rates are calculated. Loren McDonald rightfully is trying to convince the email marketing world to change the name from "open rate" to "render rate" because that is what it is. Read his articles and the comments on them here and here. Open rates are tracked by the number of times a certain image was downloaded from the sending server. So if images are not being downloaded it will not be able to track whether or not you've opened the email. Let's say your email client downloads images by default and you use a preview pane to scroll through your inbox. In this case when you preview an email in the preview pane, even if it's only for half a second, this will be counted as an open. If your email client blocks images by default and you open an email and read it without downloading the images, an open will not be tracked. In the first case, an open is tracked even though you didn't read the email, in the second case you read the email but an open is not tracked because the images were not downloaded. Only when you view an email (it doesn't matter if you open it or view it in the preview pane) and download the images, an open will be tracked. Keep this in mind when you evaluate your open rates. The only reason you should look at open rates over time is to determine a trend. Don't use the open rate as an indication of how many people actually opened and read the email, because you might be way off. What does email marketing look like in 20 years time? Campaign Monitor retested a bunch of desktop and web email clients to see how they support CSS. to help you get started with split testing, here are seven split tests you can run on your website to get and retain more subscribers, lower spam complaints, and increase response. June 19th @ 10am CDT / 4pm GMT - Hear David Daniels talk about JupiterResearch's latest research on tactics to optimize enterprise email marketing deployments in a multi-channel environment. "Not long after booking a ticket with Virgin America, my colleague, who was already a subscriber to Banana Republic's newsletter, received this e-mail. It offered a short-lived, promotional discount in honor of her impending trip." The FTC's CAN-SPAM policy will change on July 7, 2008. Here are specifics on how those changes might affect you. Is it Time to Switch to Some New Metrics Beyond Open Rates and Click-Throughs? How are Your Landing Pages Performing? How can you Increase the Average Purchase Amount and the Number of Purchases? Can you Make Your E-mails More Relevant to Your Primary Market? What Marketing Campaigns are on the Agenda for the Rest of the Year? List churn may be the least-talked-about but highest-impact issue in email marketing. Look at the facts. While every list is different, the typical rule of thumb is that about 30% of your list’s email addresses will vanish each year. This actual churn is comprised of bounces, abandoned/changed email addresses, unsubscribes and spam complaints. Say you have a target to grow your list by 20% this year. But, if 30% of your list disappears every year, you actually need to grow it by 50% (your hurdle rate). To grow lists of 100,000 or 1,000,000 to 120,000 and 1,200,000, you need real growth of 50,000 or 500,000 subscribers respectively to reach your goal. Ouch. Do you know and track your list churn/growth hurdle rate? If you don’t, simply add up the monthly address churn, multiply by 12 and add your annual growth goal — and presto, you have your hurdle rate. Oh, and it gets tougher: there is also the percentage of your list that goes inactive each month. These are people who don’t unsubscribe, but who basically check out and rarely, if ever, open or click on your emails anymore. While I’m not aware of significant research in this area, my own and others’ analyses suggest that typically 1% to 2% of your list may be going inactive each month. This adds another 10% to 25% to your annual list hurdle rate. So, if you are potentially losing 30% to 50% of your list each year to churn and inactivity, how do you plug the leaks? In this article, Loren McDonald offers a few tips. Using Google Analytics, email marketers can discover how to tailor their promotional messages, design and lay out to their audience's preferences, minimize steps in the purchase process, reduce shopping-cart abandonment, improve landing pages, and more. RSS feeds in e-mail newsletters are helping Forex Capital Markets (FXCM) push relevant information to currency speculators in foreign exchange markets, boosting clickthroughs and page views. Email is to direct mail as social networking is to...? Don't just push your message, seek feedback and suggestions - "Do not reply to this unmonitored email address" is my biggest email pet peeve! I'm sure you have someone around willing to sort through and react to the emails that need it. Most people understand when you are mailing to a list, it may take a few days to reply, so don't sweat it too much. Not only should you allow recipients to reply, but pay close attention--just like you should in the social media world--to what folks are saying to (and about) you, and even encourage feedback to make your emails more relevant. There's nothing worse than a "corporate" Twitter account that doesn't follow and respond to others, and the same should go for email. Realize the consumer is in control - In the social media world, if you say or do the wrong thing, you're likely to get flamed by users, as many brands have learned the hard way. With email the results may not be as immediate, but your email could be trashed in a blog or message board. This point is also important to remember when offering exclusive discounts. If you provide your recipients with a coupon code, it may find it's way around the net, and you might have trouble honoring your discount. Again it's about giving your subscribers what they want and keeping them happy, in turn, they'll reward you with loyalty and sales. When the new hot marketing trends come around, it's easy to forget the old favorites, however when you can apply new emerging strategies to tried and true marketing tactics, you're on your way to surefire success. It’s not unusual for larger organizations to be actively using several different email platforms to manage their campaigns. In these instances, transitioning to a completely centralized approach requires almost Herculean effort. 1. Develop and share an email marketing calendar. Wherever there’s a risk of message crossover, establish a marketing calendar to track these campaigns and assign a calendar owner. Although the owner is ultimately responsible for keeping the calendar updated, all groups should participate in the calendar development and notify the owner if campaign dates shift. My team uses a web-based calendar hosted on our intranet site; however, tools such as Google Calendar or even an Excel spreadsheet are simple, no/low-cost alternatives. 2. Ensure that all stakeholders are on all campaign seed lists. Whether you’re sending a campaign to a house or rented list, be sure and add the appropriate people to your seed lists. You may want to send test seeds to a smaller group for review and feedback, and then to a larger group for live campaign drops. This is additional insurance that everyone is aware of what messages are leaving the building. 3. Share examples of campaigns and results at cross-functional monthly or quarterly reviews. At least once a quarter, get together and share examples of campaign creative and results. Even if you’re mailing to completely different audiences, best practices are sure to emerge that you’ll want to apply to your line of business. If you work for a large organization, the idea of centralizing your email marketing may seem difficult, if not impossible. But by doing a little detective work and implementing some quick fixes that don’t require a lot of administrative overhead, you can do a lot to improve the quality of your email communications and set yourself up for more formal centralization in the future. June 10 @ 2pm EST - Join experts from the Email Sender & Provider Coalition and UnsubCentral as they team up to help marketers discover the information needed to successfully navigate the new CAN-SPAM rule provisions. The Email Wars: Do Forms Really Work in email? If you're still using a desktop client to send email marketing, it's time to drop the excuses and start being efficient. Give your subject lines one or more of the following 5 characteristics and you’re likely to draw more attention to your emails. All relationships involve give and take, and this includes the most commercial of email programs. To build loyalty, engagement and trust, you must take the initiative to cement the relationship in every email. Cynthia Edwards shares some tips.